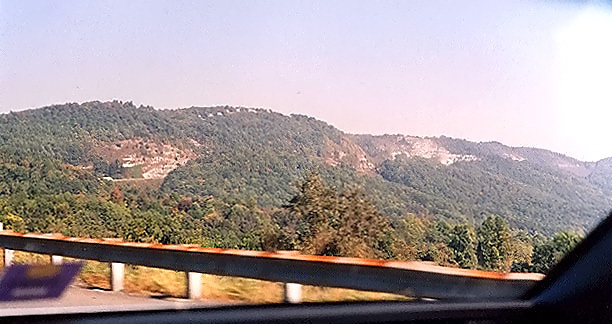 I took a road trip to the Hillsville, Virginia area, October 4-5, 2001. It was my good fortune to have the weather be perfect for the whole two days (obviously desirable for a road trip such as this where I took many photos along the way), with cloudless or virtually cloudless skies during the whole time. Fall had just started, with a small amount of leaves on the trees already having turned. I spent plenty of time exploring the area, and I took a bunch of photos. I drove nearly all of US-52 from I-81 to North Carolina, and all of I-77 from I-81 into North Carolina. I got several photos of the I-81/I-77 overlap, several photos of the I-77 New River Bridge, and 15 photos of I-77 in the Fancy Gap area. I posted photos from the first two locations on earlier articles, and the latter 15 are posted here. I drove the Blue Ridge Parkway in the Fancy Gap area also. 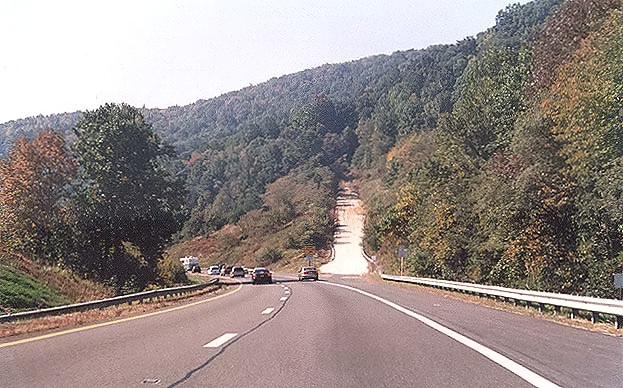 US-52 in the hill-climb area south of Fancy Gap is a fairly winding 3-lane highway with several truck escape ramps. 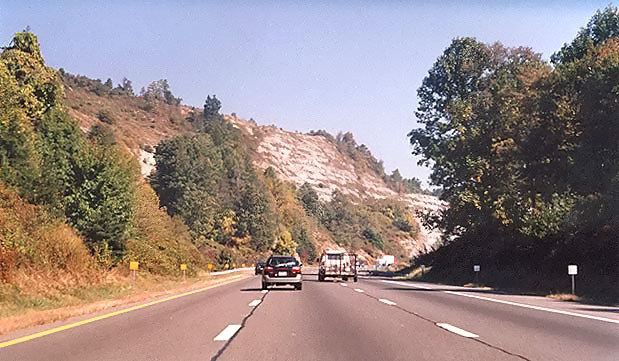 I-77 makes a six-mile hill-climb of over 1,500 feet, with a grade of not over 4.5%, commencing one mile north of the North Carolina border, with a third northbound truck-climbing lane. 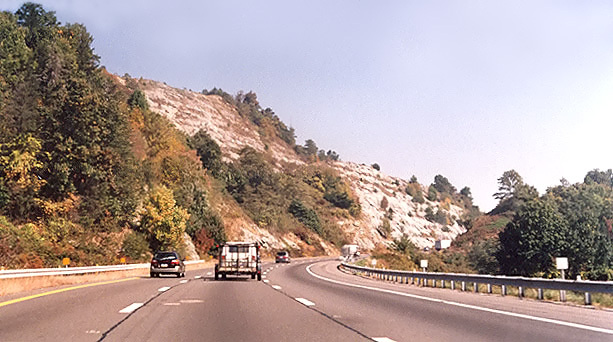 The top of the climb on I-77 is a summit called Fancy Gap, and is over 3,100 feet elevation. 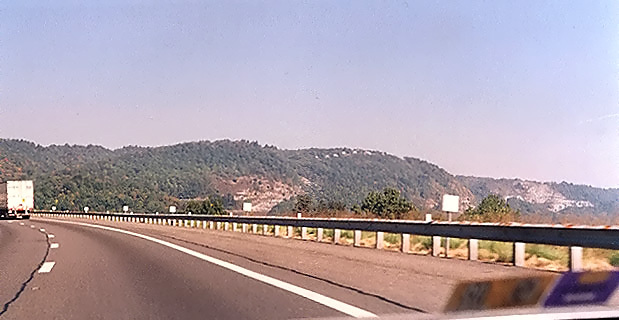 The section from NC to the interchange a couple miles north of Fancy Gap was opened in 1977. The northern 6 miles of this section traverses heavily mountainous terrain, and involved over 18 million cubic yards of excavation, making it one of the largest excavation projects in the history of the Interstate system. 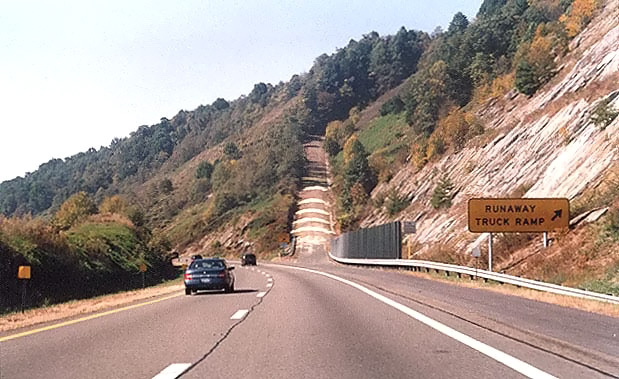 Southbound on the long grade, there are 3 emergency escape ramps for runaway trucks. 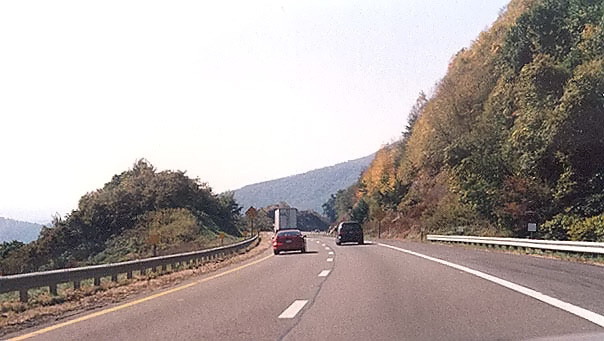 A 70 mph Interstate design was built through a very mountainous area in the Fancy Gap area. The highway has fairly busy car and truck traffic. 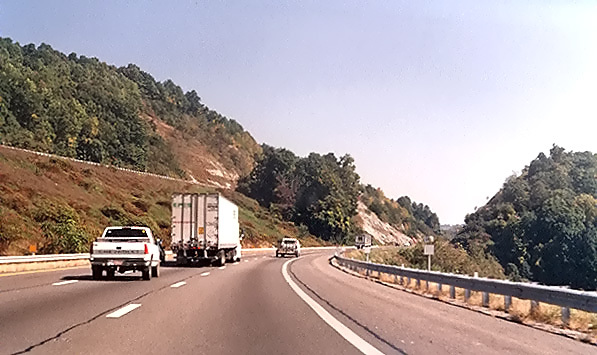 The 33-mile-long stretch of I-77 from the North Carolina border to I-81 at Fort Chiswell carries from 32,000 to 36,000 AADT with 27% large trucks. At Fancy Gap, the volume is 32,000.  The I-81/I-77 overlap has 6 lanes and it carries 48,000 AADT with 26% large trucks. The rest of I-77 in Virginia has 4 lanes. Traffic volumes are from Average Daily Traffic Volumes with Vehicle Classification Data on Interstate, Arterial and Primary Routes, by Virginia Department of Transportation, 2001. 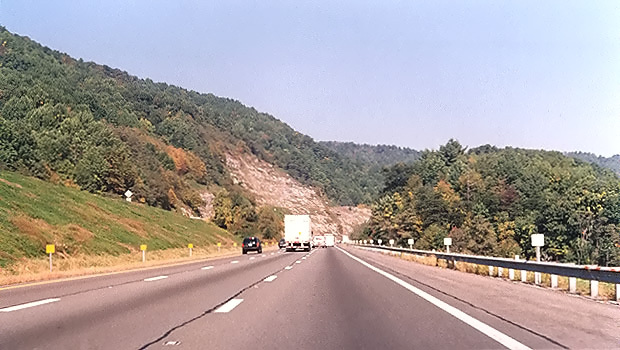 I drove I-77 through the hill-climb area about 6 round trips; this is the Fancy Gap area from one mile north of the N.C. border to where I-77 reaches the summit of the Blue Ridge Mountains 6 miles north of there. It was interesting to see it at different times of the day and at night. I basically saw it in the morning, at mid-day, at dusk and at night. It was quite interesting and is certainly one of the capstones of the national Interstate highway system. 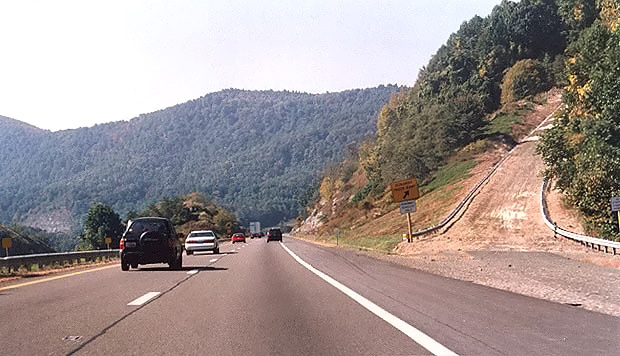 Going 65 or 70 mph you really have a feeling of speed as you pass through the mountainous terrain at Fancy Gap. Going uphill (northbound) there is a third lane for six miles, for slow trucks; and I also took the "slow scenic tour" on a couple of my trips, northbound traveling 40 to 45 mph with the trucks in the right lane. The southbound (downhill) roadway is all two lanes, and there are three different runaway truck ramps. The highway is very impressive as it gradually curves on 70 mph curves along the side of the mountains, with huge cuts and fills, and the two roadways are up to 600 feet apart horizontally and 100 feet apart vertically. I drove through there once before, in 1991, but it was rather foggy and I could not see very much. This time the weather was crystal clear. I recommend it as an experience to be savored. 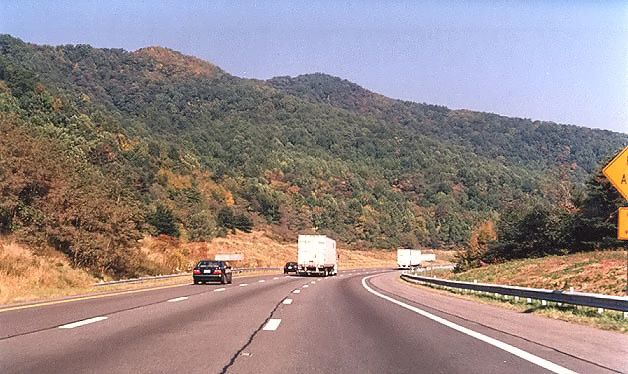 As the roadway ascends the east side of the Blue Ridge Mountains with over 1,500 feet of hill-climb, a higher and higher vista over the lowlands to the east can be seen; over 1,500 feet above near the top of the mountains. It is a spectacular vista. In the morning, there was a layer of ground fog in the lowlands to the east, with the valleys filled with fog and the hilltops above the fog -- very pretty. There was no fog around where I-77 is. In the mid-day, the fog was gone, and the greenery of rolling hills stretching to a hazy horizon could be seen in the lowlands to the east, and the daylighting of the whole area was much brighter. The mid-day is when I took my photos. At dusk, the daylight was much lower, and much of the highway was in shadow since it is on the east side of the mountains. At night, most of the highway in the Fancy Gap area is well marked with large roadside delineators, and the view to the lowlands to the east is spectacular, with countless streetlights and house lights visible far below in the distance, stretching for miles to the east. I had the notion that this area had very little population, but it looked quite well populated in the night vista. Sure, I was looking at completely rural areas, but these rural areas are well-populated rural areas. Carroll County has just over 27,000 population, and Hillsville with its just over 2,000 population is the only small town of size, so the county has considerable rural population. This would be a nice place to retire! 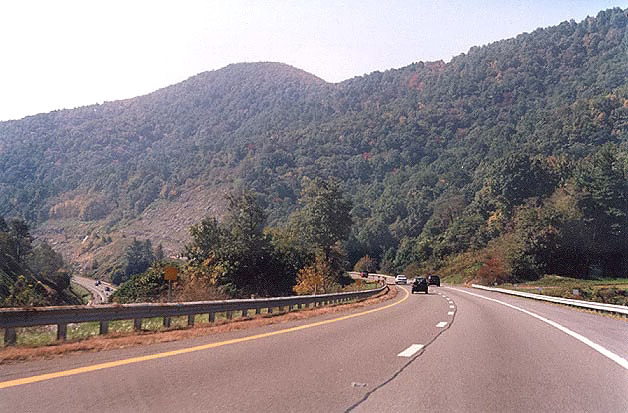 The I-77 hill-climb begins near the VA-620 interchange about one mile north of the North Carolina border, and the land is more level to the south of there, although still with rolling terrain. 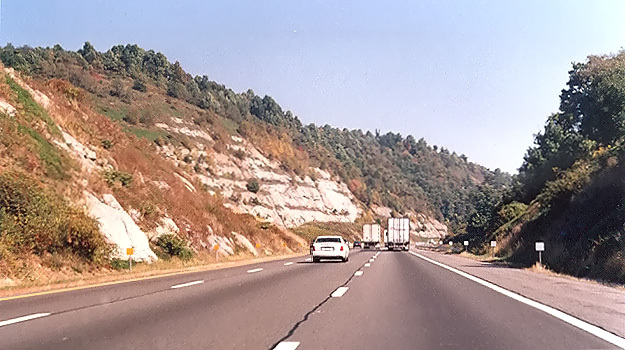 I have 15 photos, taken by me along I-77 on October 5, 2001, and the sequence is 5 photos southbound starting just beyond the summit, and then 10 photos northbound starting just beyond the start of the hill-climb. The following 5 photos are I-77 southbound, starting just beyond the start of the downgrade. I-77 southbound, about a mile south of the beginning of the 6-mile downgrade. The first of the three Fancy Gap runaway truck ramps can be seen. I-77 southbound, about a two miles south of the beginning of the 6-mile downgrade. I-77 southbound, about three miles south of the beginning of the 6-mile downgrade. The second of the three Fancy Gap runaway truck ramps can be seen. I-77 southbound, about four miles south of the beginning of the 6-mile downgrade. The northbound roadway can be seen to the left; for several miles the two roadways are about 600 feet apart and about 100 feet difference in elevation. 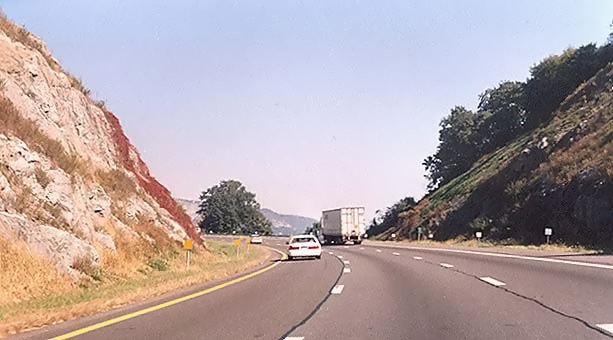 That design was used so that the Interstate would more closely fit the side slope of the mountain as the highway ascends the mountain. I-77 southbound, about five miles south of the beginning of the 6-mile downgrade. The third of the three Fancy Gap runaway truck ramps can be seen. The following 10 photos are northbound, starting just beyond the start of the hill-climb. I-77 northbound, about a mile north of the beginning of the 6-mile upgrade. The northbound roadway has three lanes throughout this upgrade, so that slow-moving trucks can have a climbing lane. I-77 northbound, about two miles north of the beginning of the 6-mile upgrade. I-77 northbound, about two and a half miles north of the beginning of the 6-mile upgrade. I-77 northbound, about three miles north of the beginning of the 6-mile upgrade. The huge cuts are visible beginning about two miles in the distance. These photos really don't do justice to just how massive these cuts and fills are, they really look impressive as you drive through the area and are able to see much more than what can be captured in photos. For one thing, the haziness of the cuts in the distance, is caused by the distance they are from where the photo was taken. The cuts to the right are near the summit, about three miles from the photo point. I-77 northbound, about four miles north of the beginning of the 6-mile upgrade. I-77 northbound, about four and a half miles north of the beginning of the 6-mile upgrade. The northbound roadway has three lanes throughout this upgrade, so that slow-moving trucks can have a climbing lane. I-77 northbound, about five miles north of the beginning of the 6-mile upgrade. The southbound roadway can be seen to the left; for several miles the two roadways are about 600 feet apart and about 100 feet difference in elevation. 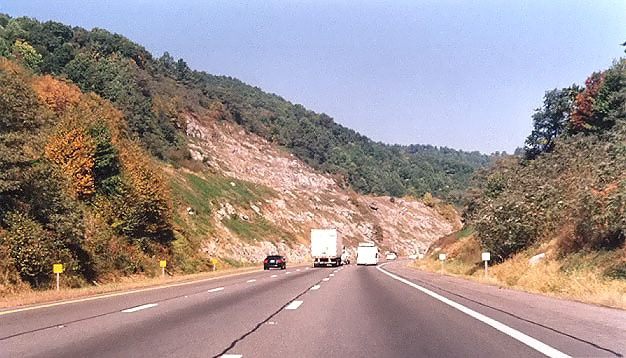 That design was used so that the Interstate would more closely fit the side slope of the mountain as the highway ascends the mountain. I-77 northbound, about five miles north of the beginning of the 6-mile upgrade. I-77 northbound, about five and a half miles north of the beginning of the 6-mile upgrade. All photos by Scott Kozel. Copyright © 2002-2004 by Scott Kozel. All rights reserved. Reproduction, reuse, or distribution without permission is prohibited.